Do I need an address on my property? The 911 system requires an exact location of the addressed structure. The United States Post Office has adopted our addressing system to replace the rural route addresses previously used. Mortgage, insurance, well installers and many other businesses are also requiring a physical address. What do I need on my property before I call? You must have the driveway and at least the footings of the structure to facilitate the global positioning system used to determine location. The time needed to process this information and determine your address is approximately two weeks. How do I apply for a New Address? 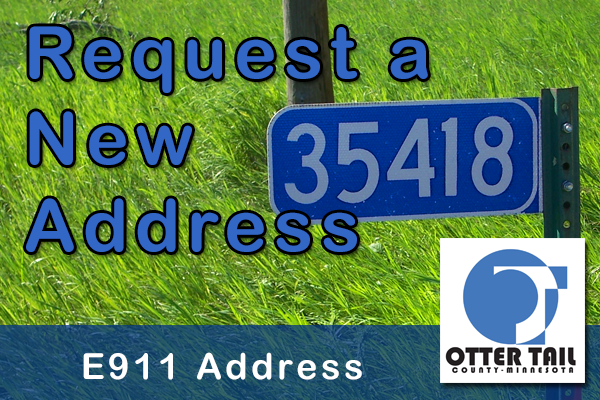 To be assigned an address, Click Here to Request a New E911 Address or call the Otter Tail County Geographic Information Systems Department to give them the information about your property. It is very helpful if you know your tax parcel number (14-digit number on your tax statement). What do I do if my sign is missing or damaged? Otter Tail County installs the residential markers per the Enhanced 911 Ordinance. If a sign is stolen or knocked down, please contact the Otter Tail County GIS Department to order a replacement. It is very helpful if you know your tax parcel number and/or your 5 digit address number, when you call.